I have another Christmas in Laylaland Ceramic Effect polish to show you today. This was the other polish in this collection that caught my eye. Like I mentioned in the other post, in the display these did not have any names. This one was numbered CE 54, but I googled it and found out the name is Green Galaxy through its listing on Ninja Polish. 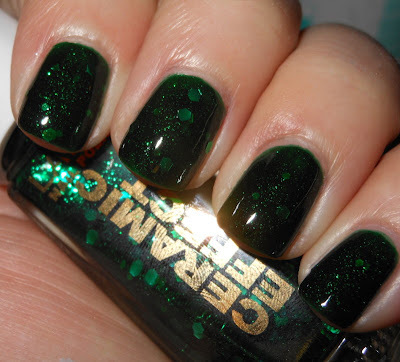 Green Galaxy is a deep green jelly base with micro green and larger hex green glitters. This is a beautiful green. I love the richness and the jelly finish of this shade of green. I know green can be a tricky color for people, but I think this shade is very flattering. The glitter in this is great, and this polish as the perfect balance of jelly base and glitter. I like that the glitter does not overpower the base. This was a little trickier to apply since it's a jelly. You could get some sheer spots towards your cuticles if you're not careful. I recommend thin coats with this and waiting in between coats for it a dry a bit before your next coat. This was $9.95 at Ulta *gulp*, but well worth it. Kinda pricy, but its sooo pretty!!! One of my biggest sadnesses is that we don't have an Ulta here! I've been in love with this polish for a while now. At least its on Ninja Polish! I'm also jealous of you Americans and your Ultas. I think if I did end up at one, it would be so hard to get me out! This is a great green, I've been thinking of trying some of these Layla polishes, I think both Harlow and Llarowe carry them. Oh wow, this is stunning!! I love greens like these! i have been eyeing this one at ulta, too. i don't know about the ceramics effects though. the one i bought was sort of underwhelming. i wish they were a bit cheaper. this one is pretty though. i might try it when there is a coupon.